With the Alphatronics Bitmap Driver, you can print to a standard bitmap file instead of a proprietary printer file format. Useful for previewing, storage, distribution, or troubleshooting printer output. 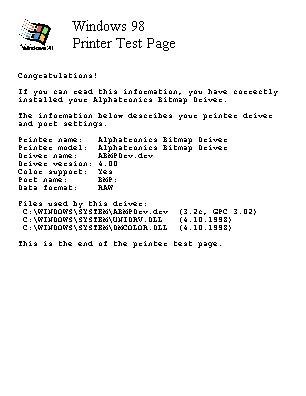 Actual image of a 36 DPI printout, converted to jpeg using the Multiple Bitmap File utility. Multiple page documents are saved as a Multiple Bitmap Format file. Please Note: This is a fully working copy of Alphatronics Bitmap Driver, but without a registration code, a registration reminder is displayed each time the driver is loaded. Version 2.0 of MBFUtil.exe is the free companion viewer and splitter utility for operating on Multiple Bitmap Format files produced by Alphatronics Bitmap Driver. The latest version will convert the output files to JPEG format. For more information, read MBFUtil.txt.